Our combined guided car or bus sightseeing tour is specially designed for those who would like to get most of Stockholm in a short period of time. Discover the renowned Royal Palace, gothic churches of Old City (Gamla Stan), Swedish design-ware shops and excellent cafés and restaurants. We will stop at carefully chosen spots including the Vasa museum and Skansen. 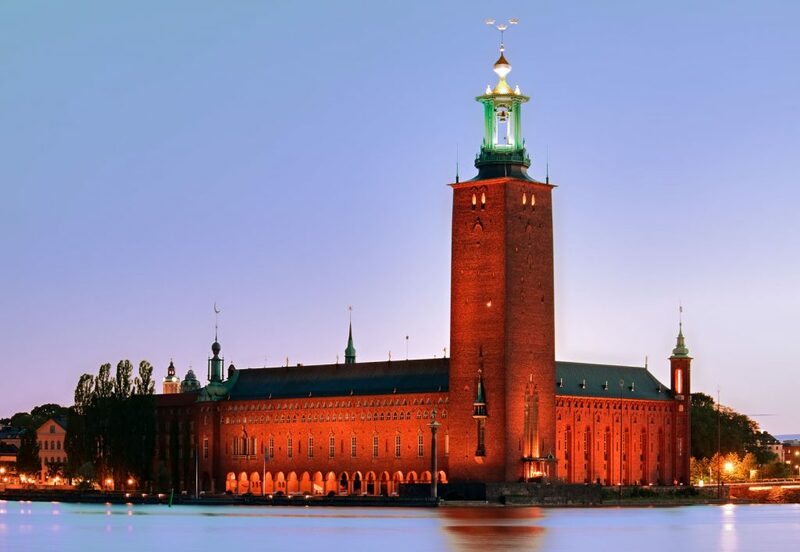 Stockholm City Hall, with its spire featuring the golden Three Crowns, is one of the most famous silhouettes in Stockholm. It is one of the country’s leading examples of national romanticism in architecture. Sweden’s capital city spreads out over 14 islands in Lake Malaren and looks out proudly to the Baltic Sea to the east. Her grand public buildings, palaces, rich cultural history and museums tell her 700 year old history beautifully. 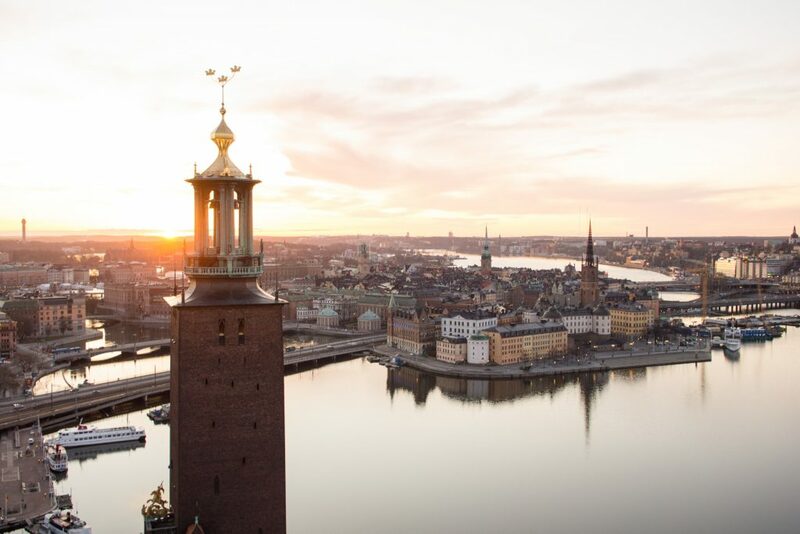 Nowhere is this better illustrated than in the Old Town (Gamla Stan); expect and get cobblestone streets, crooked but beautifully preserved buildings, the Royal Palace, gothic churches and excellent cafes, bars, restaurants and Swedish design-ware shops. 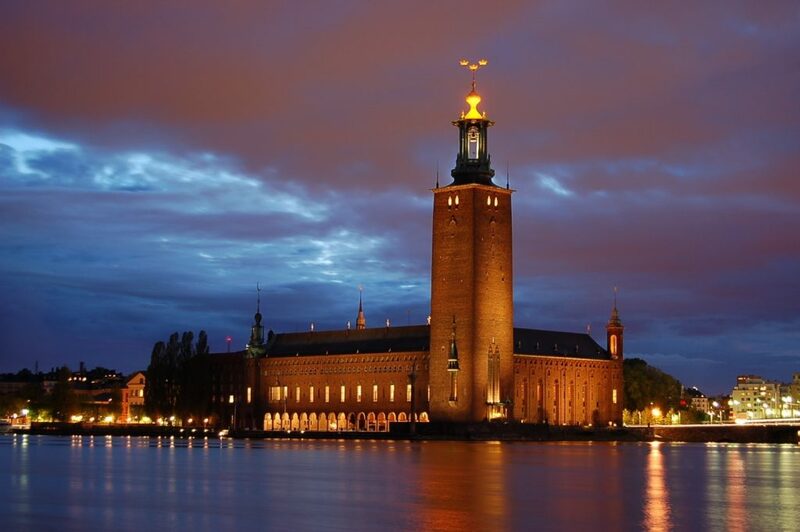 Stockholm City Hall, with its spire featuring the golden Three Crowns, is one of the most famous silhouettes in Stockholm. It is one of the country’s leading examples of national romanticism in architecture. The City Hall was designed by the architect Ragnar Östberg and it’s built from eight million bricks. 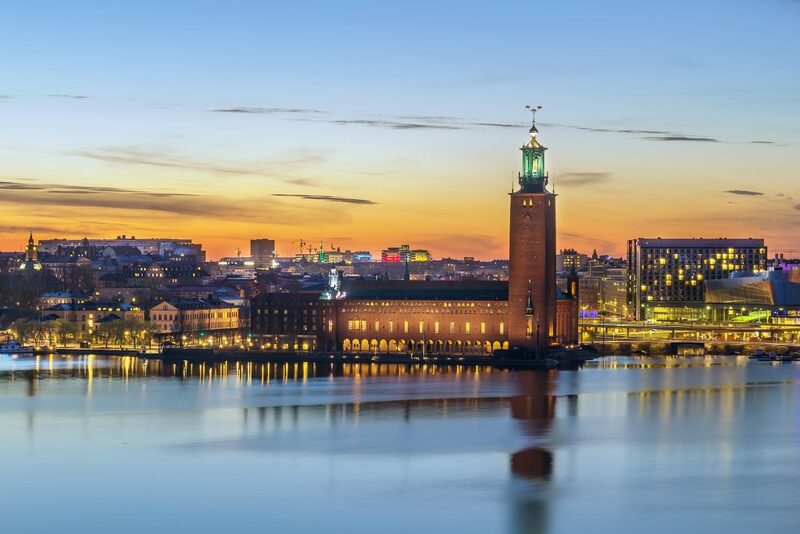 The 106 meter tall tower has the three crowns, which is the Swedish national coat of arms, at its apex. Behind the magnificent façades are offices and session halls for politicians and officials, as well as splendid assembly rooms and unique works of art. Stockholm’s municipal council meets in Rådssalen, the Council Chamber. 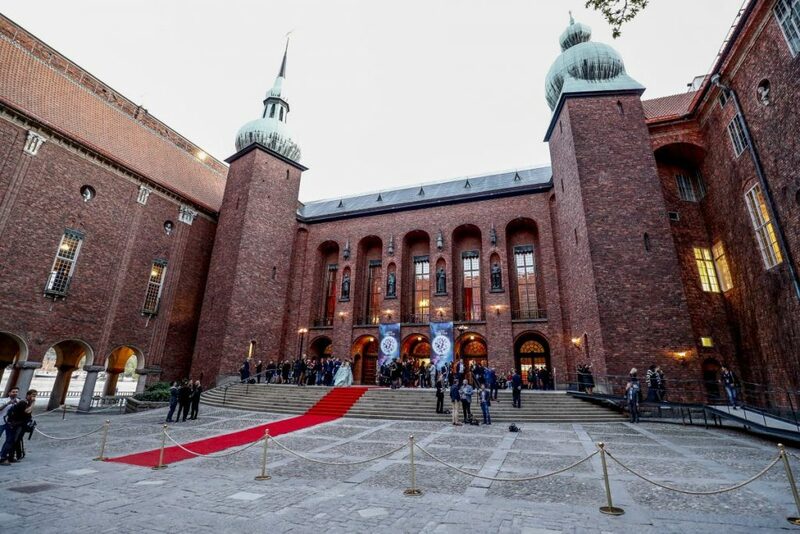 The great Nobel banquet is also held in City Hall. 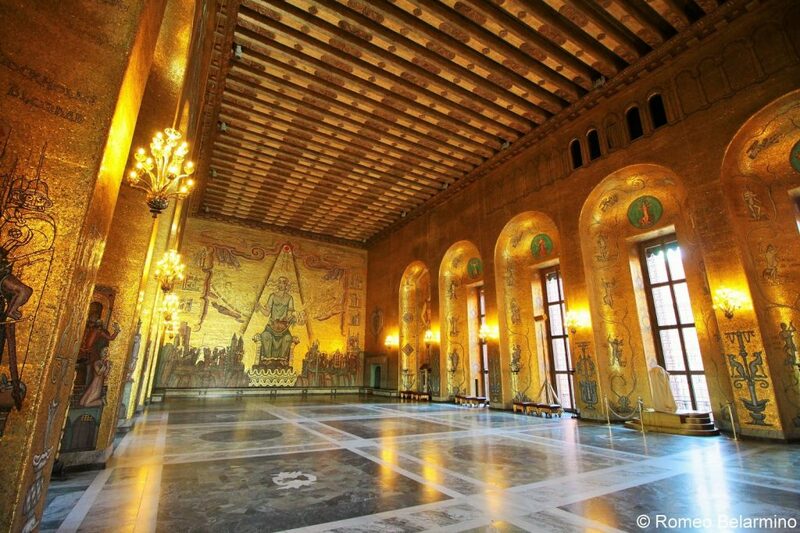 After dinner in Blå hallen, the Blue Hall, Nobel Prize laureates, royalty and guests dance in Gyllene salen, the Golden Hall, with its 18 million gold mosaic tiles. The City Hall shop features specially designed souvenirs and presents that commemorate City Hall and Stockholm. The City Hall is open to the public through guided tours only. Guided tours are held daily in Swedish and English at certain hours. During summer months the tours are available in several other languages. During the same period you can also climb up inside the tower and enjoy a fantastic view over the city. Tours can be canceled with short notice due to events.